Babel is a flexible toolkit for implementing and running agent-based experiments on emergent communication. The Babel system includes advanced modules for constructional language processing and learning (Fluid Construction Grammar), conceptualising and interpreting procedural semantic structures (Incremental Recruitment Language), and conducting multi-agent experiments in simulated environments or using physical robots. 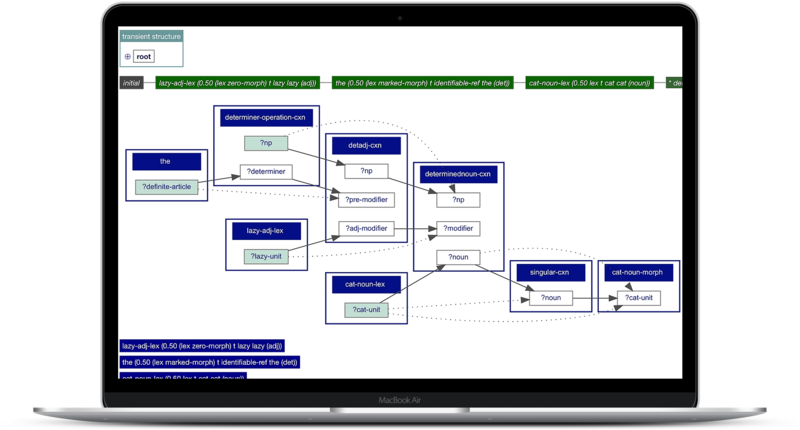 An extensive monitoring system opens up every detail of Babel’s intermediate representations and underlying dynamics. A modular design ensures that the system can be used in a wide variety of scenarios. It is therefore possible to use each component individually, according to your needs. Babel is written in Common Lisp and runs in most major Lisp implementations (CCL, SBCL and LispWorks) on all major platforms (Linux, Mac OS X, Windows). The core packages of Babel, jointly developed by Sony Computer Science Laboratories Paris and Vrije Universiteit Brussel under an Apache 2.0 license, can be downloaded here. A version of the Babel system containing additional packages and functionalities can be obtained for free by filling out the form below. What will you use Babel for? By clicking 'Request', you will receive a License Agreement to sign. AISB19, Falmouth, United Kingdom, 2019. Get in touch with the Babel team at ehai@ai.vub.ac.be.